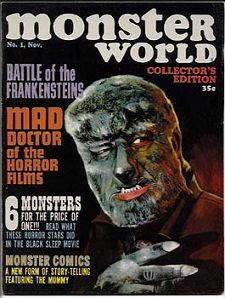 November 1964 first issue of Monster World (sister mag to Famous Monsters) with Chaney Jr.'s Wolfman on the cover. Mint condition. This mag was basically Famous Monsters with a different name. It had the same articles, the same staff, and the same ads in the back. Website design and hosting by Sohodojo Business Services. Item 248 of 466 items displayed in viewer. 0 items in cart.